Did you know that "they" is 2015 Word of the Year, per American Dialect Society? For all of us who know why, raise their hands. Yes! It means that it is now totally accepted that everyone uses "they" when they don't know the gender of to whom they are referring. Well, they say that change is the sign that a language still lives and English is indeed a living language. Heard this first on NPR/PRI's "The World" seguing into a tribute to the recently passed David Bowie, which in itself is a must-listen (hint: start at 12:28*), in which Patrick Cox who writes on language is reminded by "gender-neutral they" of David Bowie's early introduction of "gender-neutrality." When he lived, David Bowie was constantly changing and constantly challenging our idea of what gender is. Apparently, this idea of changing was something he picked up very easily as a "collector" of accents and personalities. (I too pick up others' accents easily. It used to be embarrassing in high school at the time when we had many Southerners hired as teachers, librarians, etc. The person in a position of authority always thought I was making fun of him/her them.) We think of him as a performer, but based on the interview with the BBC in the 2002, he considered himself as a writer. *But if you want to start at the beginning of the podcast, you can learn about a Long Island tribe whose front gates we used to pass on Montauk Highway on our way to Sag Harbour, Montauk Point and other points east of West Babylon. Just found an archived post on one of our blogs of note as well: Stan Carey's Sentence First: An Irishman's blog on the English language (yes, I love the name, too) from back in 2013. Mr Carey has always argued that on the side of the living language. He mentions something that I did not know -- that "you" at one point was strickly plural, also. So, what was singular? Perhaps when people started using "you" in the singular, there had been a firestorm of controversy, also. The Japanese have a word for "you," -- anata -- which I was told by an instructor of the language that it is "too cold" to use. I think she meant that using merely "anata" is impersonal, the impersonal you. The Japanese much rather say, "Oku-san" or "Otoo-san," meaning "The Missus," or "Father," like we were in a Georgette Heyer novel or something from Medieval England, in which the characters are usually saying to their own parent or duke something like, "My father is surely impatient" or "His Grace would be advised to let things run its course," as if the man weren't even in the room, let alone being the partner in a discussion. I imagine this was considered more respectful and polite than saying, "Can't you just wait a bit before disinheriting your son/issuing a warrant for his execution?" 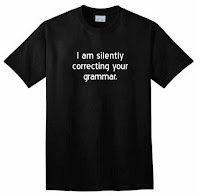 the Year, he asked if I am a grammarian. I hesitate to identify myself as one; as I'm hardly one who knows all the rules. I said that I am merely one who resists change. He then proceeded to give me two test questions, neither of which I answer correctly (or at least according to his unconfirmed grammar style book). I should have boned up on the Strunk & White, before subjecting myself to this questioning. Another customer in the store was visiting with his sister and showed off a gift from her. 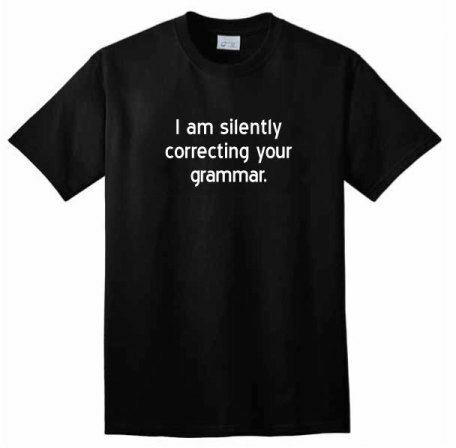 It is a T-shirt with the words "I am silently correcting your grammar." I nearly clapped my hands in delight, not so much for the thought, but for the coincidence. You never know what a person might find at a bookstore, especially if they delight in serendipitous coincidences.